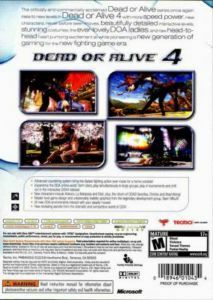 Taking advantage of the superior technology of the new Xbox 360, Dead or Alive 4 will be the defining gaming experience on the next generation console as it will encompass all that Xbox 360 has to offer, giving players the most rewarding digital fighting experience to date on any video game console. Dead or Alive 4 will be the leader in fighting games as it once again raises the bar in both online and offline fighting. By utilizing the advanced technology of the new Xbox 360 hardware, Dead or Alive 4 will redefine 3-D high definition graphics and sound, creating the most visually beautiful and realistic looking video game to date. Unsurpassed online capabilities via Xbox Live, new incredible interactive stages, an all star line-up of old and new favorite characters, and the most complex DOA countering system yet, all add up to the must-have video game to own along with Xbox 360 this holiday season. The DOA Online World: Unsurpassed online play via Xbox Live including large scale global online tournaments, increased worldwide simultaneous online play, detailed scoreboards, players can form clans, new and interactive lobby area featuring voice and text chat available, and more! 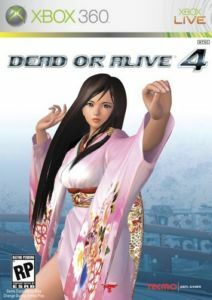 Redefining 3-D High-Definition Graphics: Utilizing the advanced technology of Xbox 360 and Team Ninja's development expertise, Dead or Alive 4 will redefine 3-D graphics creating the most visually stunning video game to date! New Characters and Old Favorites Back: New characters added to the DOA all-star line-up, and the return of DOA3 favorites, Christie and Brad Wong! New Interactive Stages: Incredible new interactive stages showcasing the incredible 3-D graphics and astounding attention to detail from each strand of the character's hair to each cherry blossom falling from the sky. New and In-depth Story Line and Cut-Scenes: All adding up to new insight into the mysterious yet captivating world of Dead or Alive. New Costumes: Each character will have a variety of new costumes to rock while they fight, some characters will even sport new hair dos and this latest installment. Most Complex DOA Countering System to Date: Fighting system will be overhauled allowing even more mastery and strategy of your favorite character, including the most complex DOA countering system yet!